The GB designation was introduced by the U.S. Army Air Force in 1941, and covered unpowered glide bombs with some standoff range. In March 1941, the U.S. Army Air Corps began the development of a very simple type of air-dropped standoff bomb. The weapon was to be a 900 kg (2000 lb) general-purpose bomb fitted with flying surfaces and a simple gyro-stabilization system for azimuth, so that it could be released by the bombers outside the enemy's main air defenses and glide towards its target. The second motivation for using glide bombs was their shallow flight path, which made it more likely to hit a building in a city than a vertical bomb, which could easily fall into the many free areas of a city doing only little damage. The USAAC (later USAAF) ordered three designs for comparative evaluation, the Aeronca GB-1, the Bellanca GB-2 and the Timm GB-3. 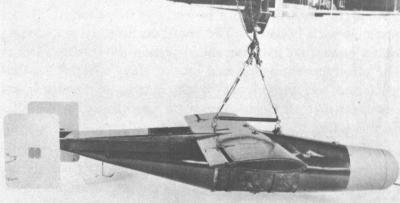 The GB-1 used a simple airframe around an M34 900 kg (2000 lb) bomb. It had a 3.66 m (12 ft)-span wing, twin tails, and a glide speed of 370 km/h (230 mph). The GB-1 did not use a guidance system. It was released when the bomber was at a predetermined altitude and distance to the target, and continued to glide on the preset glide path until impact. Range after a drop from 4570 m (15000 ft) was about 32 km (20 miles). 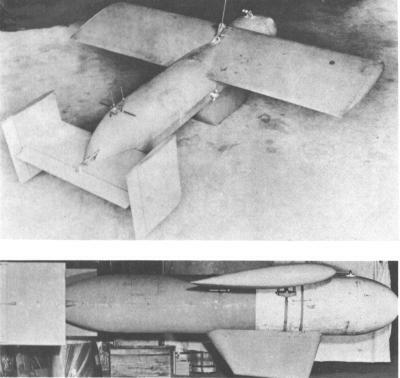 The GB-2 and GB-3 both used an AN-M66 900 kg (2000 lb) bomb. The GB-2 was 3.58 m (11.75 ft) long, had a span of 3.66 m (12 ft), glided at a speed of 497 km/h (309 mph), and used the same preset glide path principle as the GB-1. However, compared to the latter, the GB-2 had more adverse effects when carried by the bomber and the control equipment was more difficult to install. The GB-3 was 4.30 m (14.1 ft) long, had a span of 3.66 m (12 ft), glided at 270 km/h (168 mph), and had similar disadvantages as the GB-2. Therefore, the GB-2 and GB-3 were cancelled after the initial flight test phase in early 1942, and the GB-1 was selected for mass production. Beginning in May 1943, several thousand GB-1 glide bombs were produced, and the first batches were sent to the USAAF bomber force in Great Britain in September that year. However, they were not used initially, because only two GB-1s could be carried by a B-17 (one under each wing), and because the glide bombs were much less accurate than conventionally aimed free-fall bombs. The first combat use eventually occured in May 1944 in an attack against Cologne, but the results were barely satisfactory because of the bombs' low accuracy. Nevertheless more than 1000 GB-1s were subsequently dropped in raids over the Reich. Production of the GB-1 ended in January 1945, and the glide bomb was no longer used by the post-war USAAF. GB-1 airframes built by Aeronca were also used as the base for most of the guided GB bombs described in the following paragraphs. 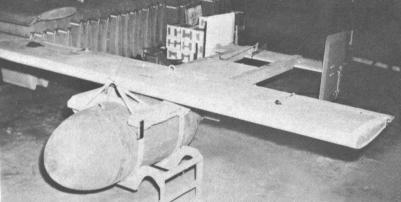 In July 1942, the USAAF's Wright Field Equipment Laboratory began the development of the GB-4 guided glide bomb under project MX-108 (later continued as MX-618). The 3.72 m (12.2 ft) long GB-4 was basically an AN-M66 900 kg (2000 lb) general-purpose bomb fitted with a 3.66 m (12 ft) wing and twin tails. Under its fuselage it carried an AN/AXT-2 TV camera and transmitter. The latter's image was displayed to the bombardier, who could then send radio commands to correct the glide bomb's course. The GB-4 flew at a speed of 385 km/h (240 mph) and the accuracy under optimal conditions was around 60 m (200 ft) CEP. The GB-4 was declared combat-ready in July 1944, and the first units were then used by a specially formed bomber group in Great Britain. However, the initial combat results were disappointing, not the least because of technical difficulties but also because the TV image was too fuzzy on anything other than a clear day. More than 1000 GB-4s were produced, but only relatively few were actually used in combat, even though the results somewhat improved over time. The USAAF also tested a pulsejet-powered derivative of the GB-4 as the JB-4, but the GB-4/JB-4 project was terminated at the end of World War II. The GB-5 (project MX-611) was a GB-1 modified with a B-2 light-contrast seeker to home on targets which were either significantly lighter or darker than their surroundings. It was mainly intended for use against ships, and tests began in 1944. The GB-5, which was quite obviously a pure clear-weather weapon, weighed 1110 kg (2445 lb) and glided at a speed of 400 km/h (250 mph). At the war's end, testing had not been completed, and the project was cancelled. There was possibly also a GB-5A variant, but I have no data about this. The GB-5C (there are no records of a -5B), developed under project MX-615, was a GB-5 variant with a Hammond-Crosley B-1 light-contrast seeker. It weighed 1130 kg (2500 lb), was later redesignated as GB-12, and was tested briefly in 1945. The GB-13 (project MX-619, originally designated GB-5D) was a derivative of the GB-5 with a B-3 flare seeker. It was intended for night attacks, where a lead plane would drop bright, long-burning flares on the target, which would then be homed on by the GB-13. Ten successful test flights were made during the development program, which was terminated in mid-1945. The GB-6, which was developed as part of project MX-612, was based on the GB-1 and had an Offner heat-seeking device to home on targets with strong infrared emissions. 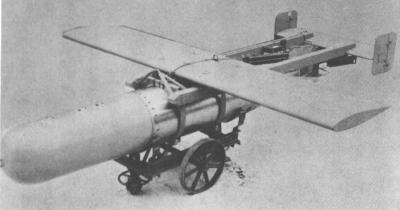 The GB-6 weighed 1130 kg (2490 lb), glided with up to 450 km/h (280 mph) and had an effective range of about 16 km (10 miles). Testing began in late 1943 and continued until 1946. The GB-7 (project MX-613) was another guided derivative of the GB-1, and used a semi-active radar homing device. The GB-7 (sometimes called "Moth") could home on a target which was illuminated by the launching aircraft's radar. Tests were conducted in June 1945, and the flight performance was similar to that of the GB-6. There was possibly also a GB-7A variant, about which I have no further information. The GB-7B (project MX-616) was a GB-7 derivative with an active radar seeker and was later redesignated as GB-14. At 1180 kg (2600 lb) it was slightly heavier than the other GB-series bombs, and had a typical glide speed of 450 km/h (280 mph). The GB-14 was intended to be used against naval targets, but the program was cancelled after only one test. The GB-7C was a variant with a passive radar seeker, i.e. it was pre-tuned to home on the emissions of a specific type of enemy radar. I have no information whether the GB-7C ever reached the flight-test stage. The GB-8 was a radio-command guided variant of the GB-1, and was developed under project MX-645. It was equipped with bright flares which allowed the bombardier to visually track the glide-bomb and apply corrective commands on the way to the target. Developed under project MX-494, the GB-9 was a derivative of the GB-4 and as such did not use the standard Aeronca airframe of most of the other GBs. After the drop from the parent aircraft, the GB-9 built up speed by diving steeply to a predetermined altitude close to the ground when the radio-altimeter would indicate pull-out. The glide bomb then proceeded for 3 to 8 km (2 to 5 miles) at that altitude. During that glide phase, the bombardier could visually track the bomb and send azimuth-correcting commands via a radio-control link. The GB-9 was primarily intended for use against targets which were relatively immune from attacks from above, like e.g. submarine pens. Work on the GB-9 began in January 1944, and in November that year a successful test flight occurred. However, the bomb was not selected for mass production and operational service. The GB-10 was to be glide bomb with TV/radio-command guidance like the GB-4, but was to use the standard GB-1 airframe instead by employing smaller TV equipment. However, the GB-10 was apparently not built. The GB-11, developed under project MX-614, was a derivative of the GB-1 for chemical warfare attacks. Instead of the 900 kg (2000 lb) general-purpose bomb, it used an M33A smoke tank to be filled with the chemical agent, and an M-2 discharge tube. After drop, the GB-11 went into a dive to gain speed, and then continued to glide for about 3 km (2 miles) to disperse its agent from an altitude of 60 to 90 m (200 to 300 ft). 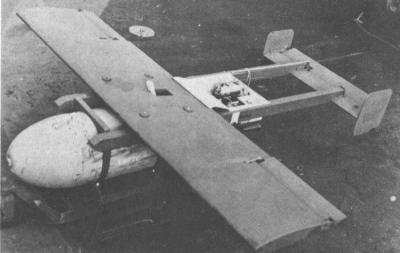 The GB-11 had only a simple gyro-stabilization system and could not be guided after it had left its parent aircraft. The program was still in the experimental phase, when it was cancelled at the end of World War II. The GB-15 was developed under project MX-717, and used a guidance system with radar and/or TV. No further details are available. The GT-1 (GT = Glide Torpedo) was a variant of the GB-1 which used a Mk.13-2A homing torpedo instead of a general purpose bomb. Like the GB-1, it flew at a preset glide path. However, the GT-1 was equipped with a paravane which trailed 6 m (20 ft) below it, and which upon entering the water triggered the explosive removal of the airframe components from the torpedo. In the water, the torpedo would travel in a preset search pattern like circles or a zig-zag. The GT-1 was first tested in late 1943, and was reportedly used operationally a few times by B-25 aircraft in 1944/45. The few available data on the dimensions and performance characteristics of the GB-series bombs are mentioned in the main text.